One of the best things about going to downtown theatre venues (in this case, Dixon Place) is the opportunity to browse the postcards for upcoming shows and events. Tonight, a postcard for Isle of Klezbos caught my eye. One, I love klezmer music. Two, it's a great name for a band. They have a couple of performances coming up - September 1st at El Sol Brillante community garden, and the one I'm thinking of attending, September 25th at 54 Below. Here is a little info about the band from their website. 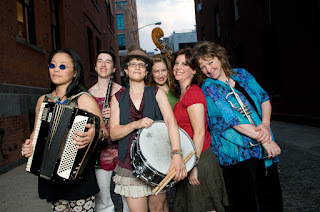 "NYC-based ISLE of KLEZBOS approaches tradition with irreverence and respect. 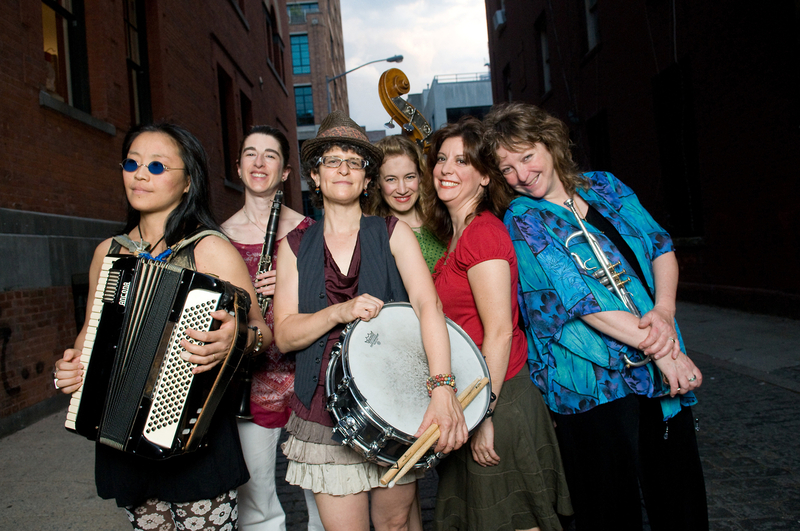 The soulful, fun-loving powerhouse all-women’s klezmer sextet has toured from Vienna to Vancouver since 1998. Band repertoire ranges from rambunctious to entrancing: neo-traditional folk dance, mystical melodies,Yiddish swing & retro tango, late Soviet-era Jewish drinking song, re-grooved standards, and genre-defying originals. ISLE of KLEZBOS concert footage has been broadcast internationally on CBS Sunday Morning, CNN World- Beat, and PBS In The Life, and the band’s live and studio recordings have also been heard on The L Word (Showtime), WFMU, Northeast Public Radio (Live at the Linda), and film soundtracks for Grace Paley: Collected Shorts, Esther Broner: A Weave of Women, and I Guess I’m Not Going to Get toVegas, among others. The band has also been commissioned to create a concert for artist Kiki Smith and studio recordings of Klezbos arrangements for multi-platinum, Grammy-nominated Scissor Sisters." Has anyone checked out Isle of Klezbos? Let me know what you think of them. Really fun band to listen to. Not much more needs to be said, but I will add that the vocals are infections- I find I can't help but sing along even if I don't know the words, but it's still fun.